Many genealogists search for a “Gateway Ancestor”. This is an ancestor who has a well- known and documented link to other ancestors further back in time. This link is normally back to a royal line, a famous person or, for example, an ancestor who sailed on the “Mayflower“. I’m looking for something different, a sort-of “Reverse-Gateway Ancestor”; that is someone who is a gateway to the many hundreds of unexplained DNA relatives I have living in North America. Recently I found one. In this case someone with both a multitude of descendants and an interesting story. Let me try and walk you through the details. We start with my ancestor Sarah Chapman. I know about her thanks to her grand-son Thomas Cornforth, born 1787 in Hawnby, North Yorkshire. I’ve already written about him here. I’m lucky that Thomas was born at a time and a place when the parish was keeping the so-called “Dade Parish Registers“. These are wonderful baptism documents that record both parents, all four grandparents and two great-grandfathers of the baptised. Below is the record for Thomas Cornforth (and, as luck would have it, his future wife Mary Barr). The records also highlight one of the problems with the Hawnby records. In 1752 Great Britain switched from the old Julian Calendar to the Gregorian Calendar. This moved the start of the year from the 25th March (Lady Day) to 1st January each year. The records for Hawnby took a little longer, church records were still being recorded with the year starting on the to 25th March as late as 1777. Elizabeth’s baptism was in 1765, but is recorded with the 1764 baptisms. Sadly there are no records of Robert Barker and Sarah Chapman’s marriage, but at least there is a baptism record that supports the earlier record of Sarah as the daughter of Thomas Chapman. This record adds one additional data point. The father, who we already know is Thomas Chapman, is referred to as Thomas Chapman Junior. This implies, although doesn’t prove, that his father was also a Thomas Chapman. The reason I’m generally cautious with these details is that Thomas was a very common name in Hawnby, so it could be the Thomas Chapman Senior was, for example, an uncle rather than his father. On the FamilyTreeDNA website both my brother and myself share a single 19 centimorgan (cM) segment of DNA with someone I’ll refer to as “Mr A” (there are a few other very short bits, but they could well be “Identical By State (IDS – genetic noise). This segment means he’s among my top 20 DNA matches, which shows how poor my DNA match lists are). The exciting part here is that he has a Jane Chapman, born in Hawnby, North Yorkshire in his family tree. Now my experience is that anyone who has Hawnby ancestors among their background is somehow related to myself. The only question is how ? Returning to Jane Chapman, she is an important link to the story of settlement in Nova Scotia by Yorkshire Immigrants. She was a part of a wave of over 1000 migrants who, between 1773 and 1775, migrated to Nova Scotia from North-East England. Their migration came at an important time in history, as the 13 colonies of the United States planned for independence. In fact there was an attempt during the War of Independence to capture Nova Scotia for the colonists in the short-lived Eddy Rebellion. of life being so dear. Fort Cumberland, where they landed, played an important role in early colonial history. It was originally built by the French forces in 1751/52 and was known as Fort Beauséjour. After the Battle of Fort Beauséjour (3rd to 16th June 1755) it was controlled by the British and renamed Fort Cumberland. This was part of a series of events that lead to the expulsion of the Acadians from that part of North America. The Acadians were French settlers who had migrated to Acadia, the northeastern parts North America). Given the details provided in the Albion’s log I thought it worth searching for Jane’s siblings. This is where we stumble upon one of the classic challenges in genealogy. There appears to be more than one William Chapman fathering children in Hawnby at this time. Separating out the families relies on a little interpretation of the results. Below is a list of the children of William, as they appear on Albion roll and then the baptism records for Hawnby (children of a William Chapman). As you may see from this data there appears to be two William Chapmans, one at “Hawnby Hall” and one at Haw Coat/Ewe Coat – possibly the same place. At this point a little background information may help. Moors folk have a habit of pronouncing words slightly different to how they are spelt, a classic example is the village of Chop Gate (Yes, there really is a place called this). The correct pronunciation in the local dialect is Chop Yat. As for the name Coat this could be derived from cote, an animal shelter e.g. a Dovecot or in this case, perhaps a shelter for sheep (nearby Rievaulx Abbey was, during the Middle Ages, heavily involved in the wool trade). Cote seems to be a common name for farms up in the Moors and and there is a farm Low Ewe Cote farm (postcode: YO62 5NE). There are also records of the sale of the Bilsdale Estate that include a High Ewecote Farm. However the most important evidence for the genealogist is that the William Chapman living at Ewe Coat had children after 1774. This makes it unlikely that he is the father of Jane Chapman and the various other Chapmans who sailed to Fort Cumberland. (As an aside, the later baptisms for this William’s children records him as the son of John Chapman and Martha Barr as his wife). Source: British Online History ‘Parishes: Hawnby’, in A History of the County of York North Riding: Volume 2, ed. William Page (London, 1923), pp. 31-37. British History Online http://www.british-history.ac.uk/vch/yorks/north/vol2/pp31-37 [accessed 12 May 2017]. 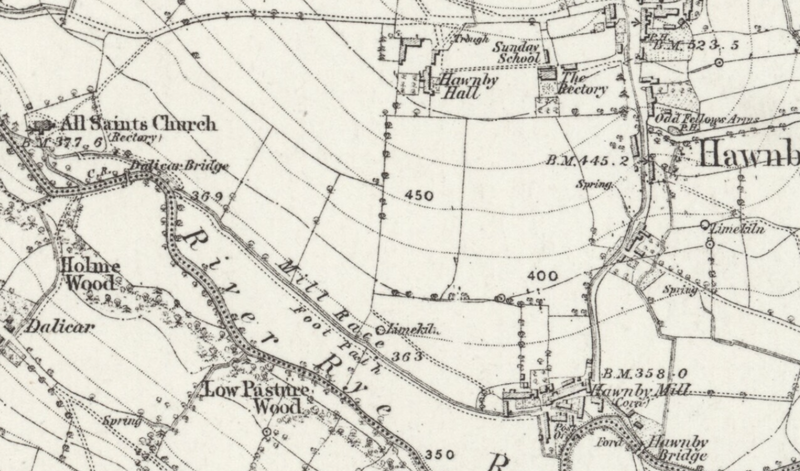 The alternative location for Hawnby Hall, looks to be a more modest farm in the middle Hawnby village, as this map from the 1854 survey shows. Personally I believe the second option, Hawnby Hall, is more likely. There is no indication that the Chapmans had a connection with Arden Hall, whilst Hawnby Hall looks like the typical Moors farmstead where I could imagine the Chapmans living. Returning to the siblings of Jane Chapman it’s clear that, if the ages recorded in the Albion log are correct, some of her siblings’ baptisms (i.e. Thomas, John, Sarah and Ann) appear to be missing from the registers. I believe that the most likely explanation is that due to the religious schism that occurred in Hawnby around this period (see below). As a result I suspect some of the children were not baptised at the Parish church. “So it was, that some years after Wesley’s conversion, that two men whose names were Chapman and Cornforth, were at work on the moors, overpowered by the heat, and fatigue, they lay down to rest under the shadow of a hedge. In their sleep they both dreamed that they were not fit to die and appear before the Judgement Seat of Christ, and wee deeply affected by a sense of their guilt and peril. “So they dreamed, and alarmed and alerted by this vision of the night watches, they decided to unbosom themselves to their friend, John Hugill, who was a farmer living in Laddle Gill, a valley about a mile distant. They were surprised to find that he also was concerned for his immortal soul. All of them looked here and there for guidance, but alas, no one seemed to understand their condition, or to have a perfect understanding of the way. What could they do? Their souls were in torment, and oh the pity of it, there was none to guide or direct. “God never lets his sons go to breaking point, there may be days when the stars are blotted out, but always there is a ray of hope. “So it was that while those men were groping their “valley of Achor”, the door of hope was opened. Some will say by chance; but I like to think that in the providence of God, a newspaper came into their hands, (a rare thing in those days), in which it was announced that John Wesley would visit Newcastle. But sixty miles lay between those awakened men and this City. It’s probably not just a co-incidence that the Hawnby Dreamers were inspired to learn more about Wesley’s preaching. Hawnby is only around 8 miles away from Osmotherley, one of the first Methodist sites in this part of Yorkshire, which John Wesley visited as early as 1745. 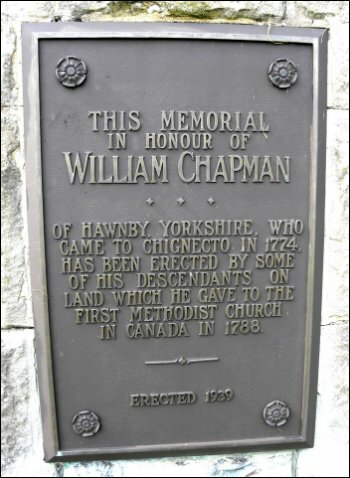 The Chapman connection with Methodism, and the problems this had created in Hawnby, may well account for at least part of the decision by the Chapman family to emigrate to Canada. This would put William as just two years younger than my Sarah. Rather nicely there is a Thomas Chapman baptised in 1705 who could be the father of both Sarah and this William. As you can see he is the son of another Thomas Chapman, making him Thomas Chapman Junior – as suggested by Sarah Chapman’s baptism record. Sadly, as yet, I’ve been unable to trace Thomas Chapman’s marriage or even his wife’s name. The eighteenth century was not very generous to female ancestors. Going back to my original DNA match “Mr A.” I’ve checked both his and my family tree and can see that we are both 8 generations down from our shared ancestor, Thomas Chapman. This makes us seventh Cousins, which incidentally is a long way from FamilyTreeDNA’s calculation of 2nd to 4th Cousins. That’s not a big problem, just a feature of the randomness of DNA recombination. But it is good news in that I implies that I have at least one section of DNA from Thomas Chapman and/or his unknown wife. Interestingly, if you look at the chances of matching a seventh cousin it’s only around 1% or less (depending on which company you test with), the flip-side is typically you should have around 120,000 seventh cousins. This brings us nicely back to the original point of this post, the search for my “Reverse-Gateway Ancestor”. Looking at a family tree of William Chapman you see that he has somewhere around 76 grand-children, most of whom made it to adulthood and parenthood. Even with only a 1% chance of matching the living descendants of these 76 people I guess there is a good chance I’ll find a few more Chapman relatives in North America. 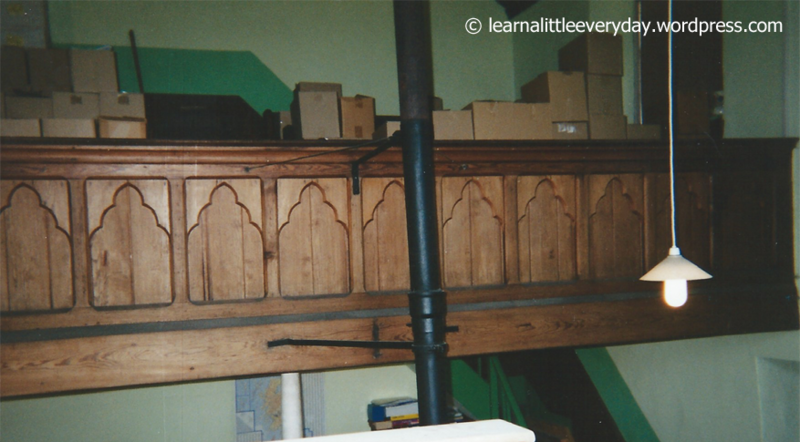 It would be nice to think that this Harmonium was a gift from William Chapman. This entry was posted in MyFamily and tagged Acadia, Acadians, Chapman, Chignecto, Fort Cumberland, Genealogy, Hawnby, hawnby dreamers, methodism, Nova Scotia. Bookmark the permalink. How very interesting! I to am a descendant of the William / Mary Chapman line and enjoyed reading about the possible reasons for their migration to Canada. I’m glad you like it Cheryl. It’s nice to be able to connect the Old World and New World Chapmans. Wonderful article – thanks! I’m also a Canadian descendant of William & Mary Chapman, via their daughter Mary (age 9 at the time they migrated). She married George Taylor, who was on the same ship, and had a large family. I thank you also for this article. I am a descendant of William & Mary Chapman, via their son William. Fabulous article that touches on the intracacies of solving genealogical problems, the intersection of local historical events and the challenges of identifying shared common ancestors with DNA matching. I am not related to the Chapmans but, as I mentioned in a previous comment, I am related to another of your ancestors, Arabella Tully (daughter of Nicholas Tully & Margaret Mothersill). I have had similar experiences with the DNA matching – lots of ‘DNA cousins’ with deep American roots. However, I too have beaten the 1% odds quite a few times to establish genealogical relationships with DNA matches well beyond the 5 or so generations that the science promises. And oddly enough, I have also come across a family who sailed on the Albion to Nova Scotia in 1774 – Bryan Kay of Osmotherley with his wife Dorothy Shipley and their 5 daughters along with his brother Robert. Sadly, two of the daughters drowned in the harbour at Nova Scotia as they were larking around whilst waiting to disembark the ship and start a new life in a new country. In my case, the ages on the passenger list were pretty accurate and easily matched up with batpismal records. Thanks Jane for your comments, I’m glad you enjoyed the article(s). It’s interesting that your Osmotherley relations were also part of the 1000 or so Yorkshire Immigrants. I guess the same push and pull factors affected them as much as their neighbours over in Hawnby. I’ve noticed that it wasn’t the only time that Hawnby folk moved to Canada. Another DNA match I have is related through Edward Barr, who was the son of William Barr and grandson of Edward Barr and Anabella Tully… Someday I need to write that up. Hello! I went to Chignecto 2000 reunion in Canada, and am a descendant of William Chapman! I spoke with Don and gave him my information. My ancestor moved from Moncton, NB, Canada to North Dakota. I also went to Hawnby and saw the house. I hope you enjoyed the visit to Hawnby, it’s (IMHO) a wonderful part of the world. I read about the Chignecto 2000 reunion, it must have been an amazing event to see so many people descended from the original settlers. Hi, thank you for the article. It’s nice to read about those Ancestors of mine, I’m a 4th Generation away from the Chapman Surname but they are still within the North East of England. Stockton-on-Tees in particular which isn’t that far from Hawnby Hall Yorkshire. Thank you so much for the extensive research. I am a descendant of William and Mary through Thomas. This really fills in a lot of history for my family! Hi, Very interesting article. While doing my genealogy for my Smith family John L Smith married Jane Chapman. He arrived on the Albion with his family from Osmotherley. Looks like we are related. If you are still delving into your Chapman tree I have the baptism records of the children I believe belong to William Chapman and Mary Ibbotson. Let me know if you would like the information. apologies for the late reply. I’m hoping that your list matches my research. If you can drop me the list I can check. My name is Scott Noddings and my dad (Keith) and i came across your blog after a few links from a DNA match we discovered via Ancestry. We have traced our family name back to All Saints Church Hawnby. We know one of our ancestors Michael Noddings (1726) married Mary Chapman (1734) at Hawnby, We have Mary possibly as the youngest sister of William and Sarah Chapman of Hawnby. Also are you aware of the following blog,,,,,? Many thanks for getting in touch, and my apologies for the late response. Let me try and answer your question as best as I can. I had a quick look at the Hawnby Parish Registers, which are online at findmypast.co.uk. I can see the marriage record record (on 26th Feb 1754) for Michael Noddings and Mary Chapman. Unfortunately, as is common with such old records, the details are sparce. The full entry reads “Michael Noddings & Mary Chapman both of this parish were married by Banns published”. This makes it a little difficult to fully identify Mary’s parents, other than by trying to build up a picture from the complete parish records and try to identify where Mary might fit in. One of the other commentors on this article (Lyn) has been doing a one-place study on Hawnby, so may be able to shed more light on Mary (I’ll contact her and let you know if I get any info back). A couple of other comments – I couldn’t find a Hawnby baptism record for Mary Chapman in 1734, only an Alice, daughter of John Chapman, baptised on December 10th. 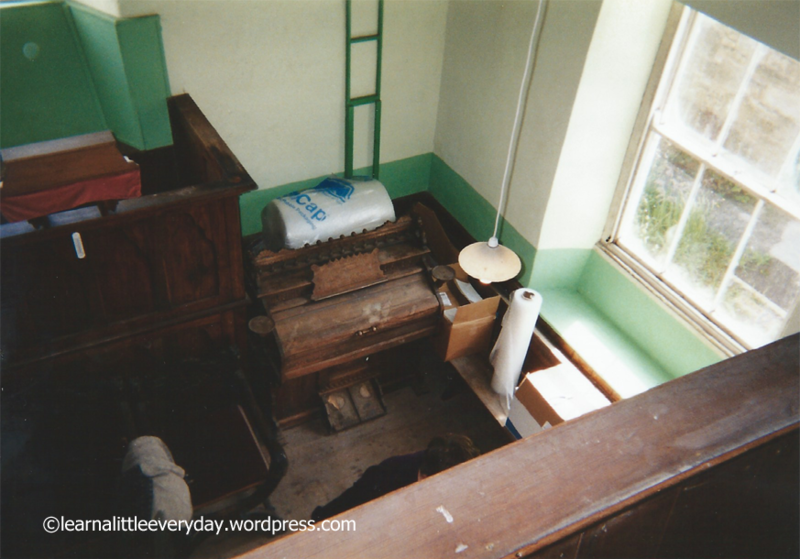 Also, I had a read of the link you sent regarding your research around Stokesley. Whilst I know the area well (I grew up in Stokesley) I’m afraid I don’t have any information on the families you are researching. If I find anything on the Chapman’s I’ll drop you a line via the email you supplied.